Toyota are at the forefront of research and development in the motor industry. Their innovative efforts have helped produce a huge range of cars which have been made with reduced manufacturing costs, that are passed on to the customer. This makes them a fantastic choice for a used car, since you can get excellent value for money and a reliable and well-made motor. RAC Cars' range of used Toyotas has all the fan favourites from superminis to large 4x4s. This Japanese car manufacturer has built a reputation for making structurally sound vehicles that are some of the biggest and well-known in the world. There are so many bargains to be had when it comes to Toyota. A low mileage used Toyota Auris or Toyota Avensis is as close to bullet proof as a used car purchase can be. 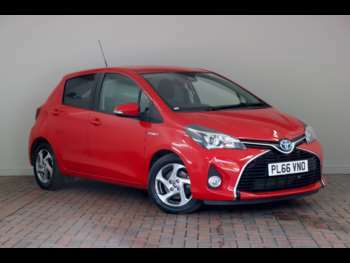 The Toyota Yaris is considered one of the best superminis around in terms of performance and efficiency. If you’re looking for a compact 4x4, Toyota Rav 4 is a good choice. But, if you’re more of a city car lover, you may find you love our used Toyota Aygos. Other popular makes include iQ, Urbancruiser, Verso, Prius and Landcruiser. Toyota are the first company in the industry to manufacture more than 10 million vehicles per year and have over 339,000 employees. As a world leader for innovation, they are one of the most reputable car companies across the globe. Toyota have won countless awards over the years. A few recent ones include the 2017 “Best Car Safety Award” with the Toyota Prius at What Car. This model also won “Best Eco Car” at the Telegraph Car awards in 2016. To top it off, the Toyota Corolla was awarded with the 5-star overall safety rating by NHTSA (National Highway Safety Administration) in 2016. Check out RAC Cars' range of used Toyotas for sale, to get great deals on reliable and trustworthy cars. Got a specific Toyota model in mind?